We're indoors now with the patio door slightly open to circulate the air, which I'll close once I finish this post. I'm starting to feel a headache brewing. I hardly get headaches. On Wednesday evening I had a doozy of a headache, which I think developed from breathing the air all day while driving with windows open and wandering outside around Santa Cruz. The headache didn't go away until after breakfast the next day. 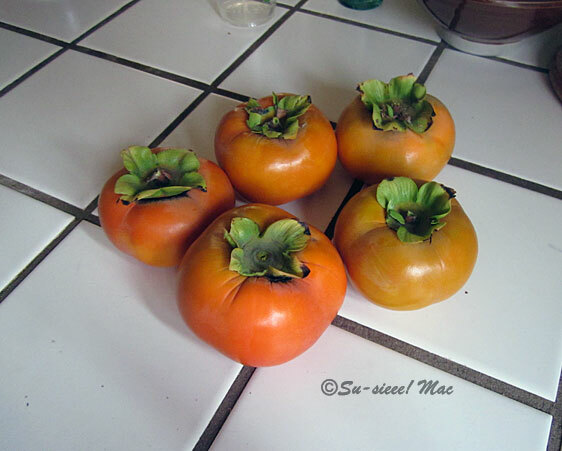 This year we harvested only five huge persimmons from our tree. Last year's crop was so huge that we were giving persimmons away for months. At first I thought we got few fruit this year because I pruned too many of the lower producing limbs so that people taller than me could walk around the yard. But, the upper branches showed only several fruits that the birds have been eating. Hopefully the persimmon tree will fare better next year. Last night I came across a pencil that had Eagle "Chemi * Sealed DRAUGHTING written on it. The pencil begged to be tried. So, I did. Permissions is the only thing that really grows in my inlaws yard. Persimmons? Although I like idea of permissions growing in a yard. Thanks, Soma! I was carrying that pencil in my pocket for days, haha. I'm sure Molly appreciated the 'breffs' even if they were a bit smokey. :) . . . hopefully there's a change in the weather coming soon to cool things down for you and blow the smoke away. We may have rain tomorrow evening. Knock on wood, cross fingers, and everything else. Hopefully the projected rain is coming. That might help clear the air a bit. Although, it would be hell for the burn areas. It was cold and dark today. All that was missing was the rain. I've never seen persimmons growing... were they sweet? They were huge and intense in taste. Just right sweet. If they had ripened, they would've been outrageously sweet. 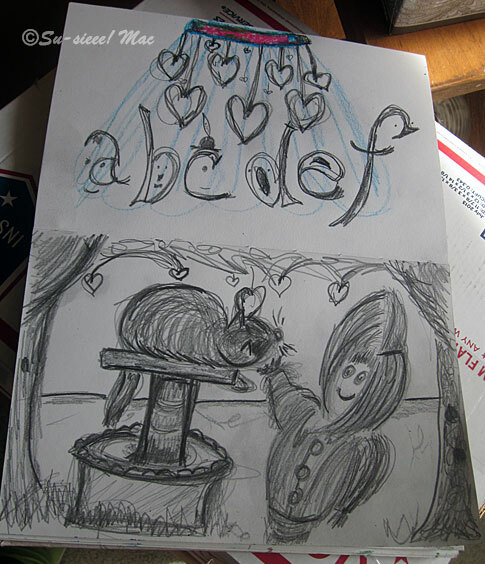 Hmm, methinks the pencil wishes to draw the last of the persimmons. Oooh, terrific pencil usage . . . I would be surprised if you didn't try a pencil that mysterious and tempting. Persimmons are but strangers to me, I'm not sure if I've even nibbled one but wow, I'm glad the smoke didn't damage your veggies too. Man, be careful when you're outside,. Does AC pull air from the outside and filter it? Isn't the county telling you how to deal with all this and handing out masks and filters and such? My gawd what is it doing to little and elderly or weak lungs. I adore cherry tomatoes of any color, those and strawberries are the tastiest things I've ever grown. We had only volunteer tomatoes this year. I pulled them, they were looking so sad. We don't use AC so cannot answer your question. Even with our windows and doors shut tightly, we were still feeling effects. Until our first clear day, I didn't realize that it was hazy indoors. Bad, bad. Both the Husband and I now fall into the category "unhealthy for old people and people with bad hearts" so we stayed inside most of the time and didn't do any exhausting physical activity. This has been a bad year for air quality because of fires. Hmmm, that may be why we had a poor persimmon crop. By the way there are 2 types of persimmons. The Fuya persimmon is the type to eat. It's firm and crunchy, delicious. The other kind is heart shaped and if you experience eating that first, you may not want to eat persimmons anymore because you think they'll taste the same. This heart-shaped persimmon has a gummy mouth feel to it. It's perfect for baking. They were mighty tasty. Wish we had more than five. Maybe had a dried persimmon but still not sure. I must seek out the Fuya next trip to the grocery store. I can't imagine how uncomfortable and scary that is. Maybe if you smoked a bunch of weed you wouldn't know the difference. I think the weed would enhance the gumminess feel in your mouth. I do hope the fires and all that came with them disappear. 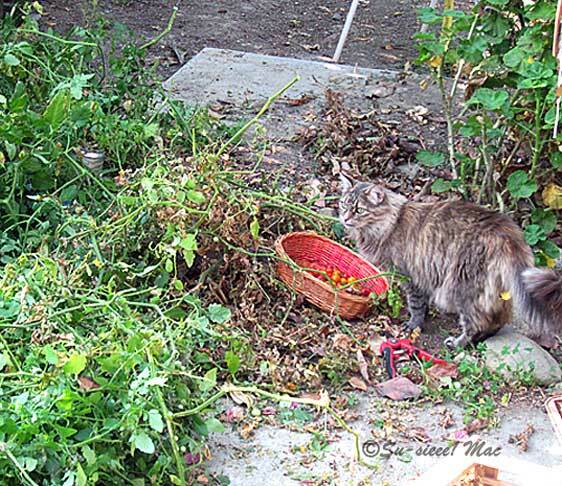 I'm glad you got a little time outside and a few tomatoes, too! The rain has done a good job of cleaning up the air in our area, hurrah!